ProfileBringing a Willy Wonka and the Chocolate Factory element to flagship Topps, 2017 Topps Now Golden Ticket redemptions yield one-of-a-kind cards from the Topps Now Baseball checklist. Found in 2017 Topps Series 1 and Series 2 packs and boxes, the very rare Golden Tickets can be redeemed for a special stamped card for every Now Baseball card issued on the date noted. As many collectors know, the 2017 Topps Now Baseball set takes current events and makes them into real-time, on-demand cards through the Topps website. The 2017 Topps Now Golden Ticket Baseball cards tweak that formula to offer the online-exclusive MLB cards in flagship packs via redemptions. 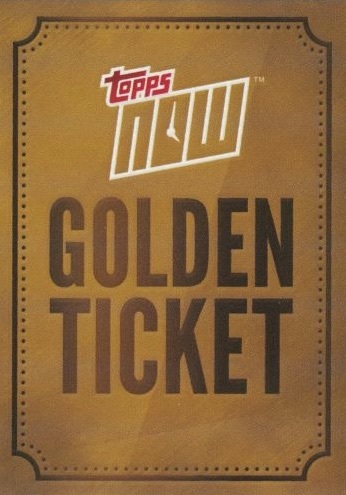 Each Golden Ticket features a specific date from the 2017 MLB season and the card is good for a stamped version of every Topps Now card released on that particular day. Shop for 2017 Topps Golden Ticket cards on eBay. While the 2017 Topps Now Golden Ticket Baseball redemptions debuted in 2017 Series 1, they are also found in Series 2. The difference is the dates covered in the Topps Now lineup. Series 1 contains redemptions for stamped releases from Opening Day (April 2, 2017) until the game before the All-Star break. Series 2, which releases in June, covers the regular-season events that come after the All-Star game. At this point, only a few have popped up online, but sales have been very strong. View the 2017 Topps Now Golden Ticket listings that have sold on eBay. Collectors can also find redemption codes for more common Topps Now instant-win cards as part of the Rediscover Topps Ultimate Giveaway. For more information, you can review the official rules for the 2017 Topps Now Golden Ticket promotion. Did you pull any of these cards? What do you think about this redemption concept? Let us know in the comments.